Seafood today! I don’t cook scallops very often but I feel it’s important for my family to have a full repertoire of tastes. This is a very simple and quick recipe that I got from the food network. Very simple ingredients to marinade the scallops for 20 minutes, a quick throw in the pan and you’re done. I used a bag of frozen sea scallops that I had in the freezer but fresh is always better. How to make: Wash the scallops and place them in a glass bowl. Mix them with the olive oil, garlic, thyme, salt and pepper. Let them stand for about 20 minutes. Coat a big pan with olive oil, heat well (high heat) and saute the scallops until the become golden brown. About 2 minutes per side. I tossed the greens with a little vinaigrette and served with 3-4 scallops on top. For the kids, I served the scallops on top a bowl of pasta. 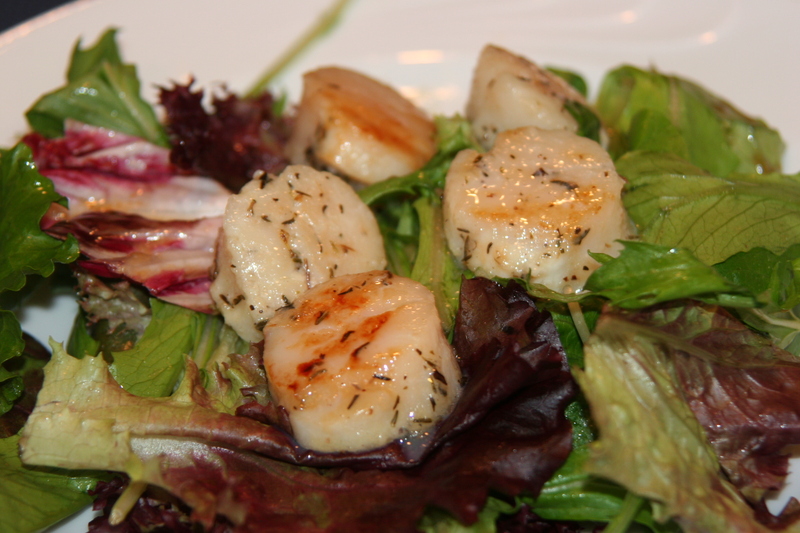 I love scallops and this is such a easy and quick way to prepare them! Magda, welcome. Easy and quick (and yummy, of course) is the essence of this blog 🙂 It’s great to have you here. Next, I’m trying your mushroom soup! I just saw it on your blog and it looks beyond!